Do You Need Help with Your Graphic Design Personal Statement? Getting a job as a graphic designer can be very rewarding with median pay hitting over $44,000 a year. This is a growing industry that is always looking for new recruits; however first you need to get your qualifications. With a huge amount of competition for some of the better courses it can be very hard work to get accepted. This is where your personal statement for graphic design comes in; this your chance to make yourself really stand out from the many other applicants. A well written statement will often be the very deciding point when it comes time for the committee to make their selections. The problem is that writing that perfect and attention grabbing personal statement is never easy. Our superior tips and writing services however can help you to ensure that you will always submit a well written personal statement for your graphic design application that will make you stand out. Many students fail to invest the time and energy required into writing their personal statement thinking that their grades will carry them. However, the likelihood is that many of the other applicants are going to have very similar grades and the committee will be looking at your personal statements to tell you apart. Therefore you will need to ensure that you put a lot of work into ensuring that your statement covers everything that they will be looking for. Always write your personal statement specifically for each place you apply to. Look through some good personal statement examples connected to the same field to get a better idea of what is required. Open with an attention-grabbing hook, preferably a relevant and interesting personal anecdote. Always ensure that your statement flows well from start to finish; it should read like a story not like your resume. 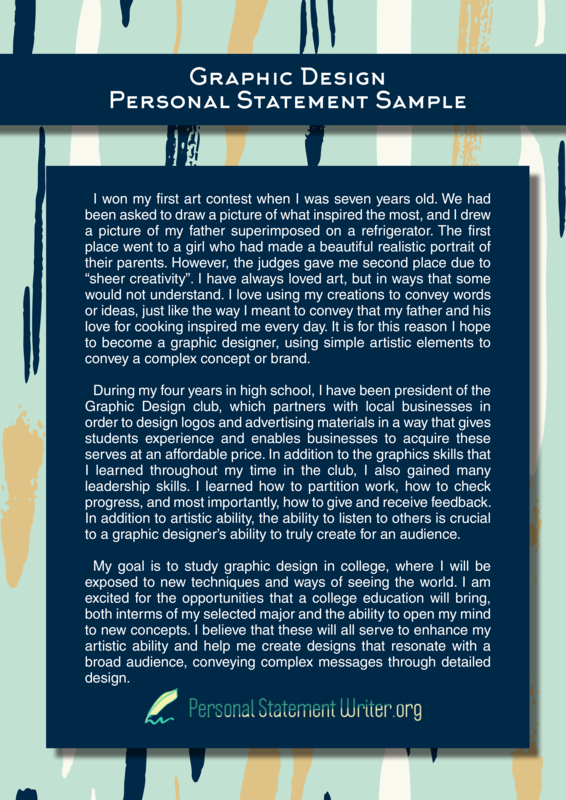 Why is it that you want to study graphic design? What have you already done to pursue your interests in this area? What skills do you have that will help you in this area? Why are you applying to this specific institution? Avoid the use of clichés within your writing at all times. Never repeat information that is included in other parts of your application. Be concise in how you write and don’t use filler. Be relevant; never use anything that does not directly help you win a place. Avoid language that is confusing or difficult to understand; don’t use acronyms or slang. Never use humor as it will not impress everyone. Always be truthful and honest in what you write. Carefully proofread and edit your work to avoid even the smallest errors. Check out 5 tips on how to improve your London personal statement! Writing a personal statement that will get you noticed is tough even if you follow our writing advice. One of the options you have is to use our highly specialized and very qualified services. So if you want to ensure that your graphic design personal statement is going to make you stand out from the others get the professional and specialized help that you can trust from our services here today.